Beloved chili. Passionate chili. Hot chili...and not just because of the chiles. Chili, the star of cook-offs, is the obsession of societies, and the subject of endless debate over its proper preparation. Has there ever been a better time to be a chili head? A well-stocked supermarket today carries a variety of fresh and dried chiles, fresh cilantro, myriad dried and canned beans, chipotle powder, and all the makings for sides and salsas, from tortillas in the refrigerator case to organic avocados. 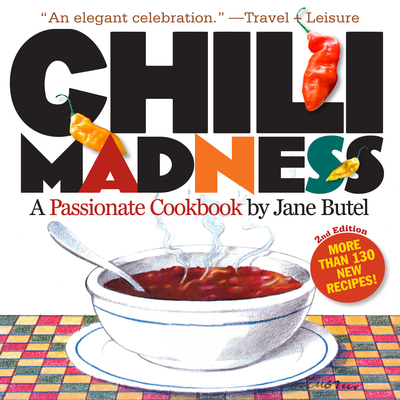 Jane Butel's "Chili Madness" has been praised as 'an elegant celebration' ("Travel + Leisure") that 'chile lovers will love' ("New York Post"), it's the spicy bestseller with over 330,000 copies in print. 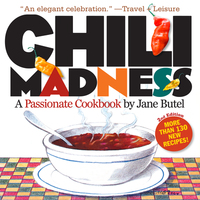 Extensively revised, updated, and expanded, the book will fire up a whole new generation of chili fanatics. Of the 160-plus recipes, more than 130 are brand-new. Here are classics, including Reno Red and Navajo Green and Buzzard's Breath Chili, as well as newfangled bowls like Moroccan Chili and White Lobster Chili. To accompany the main event are savory breads (Bacon Crumble Cornbread); tempting sidekicks (Hot 'n' Spicy Okra, Red Hot Sweet Potato Lace); fire-taming salads (Crispy Cilantro Coleslaw); and, margaritas, of course. (Six kinds!) Luscious desserts such as Double Chocolate Farmer's Cakes provide the perfect sweet ending, while chili leftovers are reinvented in crowd-pleasers like Texas-Style Burritos.